Bria Neff is an amazing nine-year-old artist and conservationist. After learning that species all around the world are becoming endangered, Bria decided she would start a project to save the animals. Her Roots & Shoots project is called Faces of the Endangered. Bria’s idea for the project came about when she participated in an art contest hosted by the International Fund for Animal Welfare (IFAW). She submitted a painting of an African lion, which became one of the 18 winning entries. Bria then decided she wanted to paint even more endangered species. “I wanted to raise awareness and save the animals,” Bria explains. 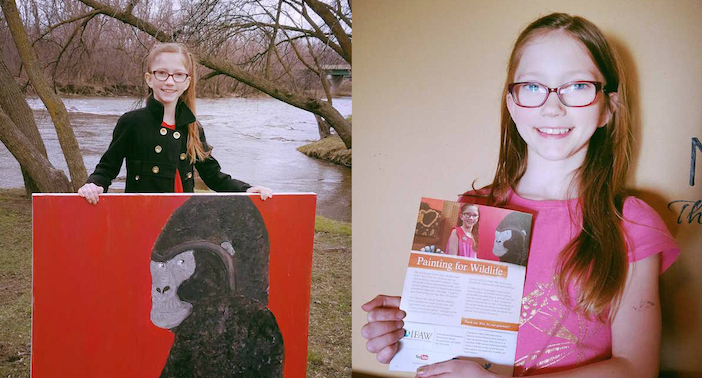 By selling her detailed and attractive paintings of endangered animals, Bria has raised $1,600 to date which she has donated to IFAW. Bria has set new goals for her project this year…she hopes to raise $3,000 by the end of 2016. Through Faces of the Endangered, Bria has learned about issues such as habitat loss, conservation, climate change, human conflict, and deforestation. “It’s our responsibility to take care of all animals. All kids can save the world and I want them to know that,” Bria says. Her creative process is thorough. Before painting a species, Bria first finds pictures of an animal and studies them. She also researches information about the animals that she paints, and even writes a report about each species! Her favorite pieces are a painting of a penguin in celebration of World Penguin Day, and a wolf. Bria uses mediums such as acrylic and watercolor on canvas to create her masterpieces. When asked about how Dr. Goodall inspires her, Bria quickly replied, “Well, her work with the primates and how she teaches everyone. She makes me smile and I want to meet her one day.” Being a Roots & Shoots member means a lot to Bria, because she recently received a Roots & Shoots mini-grant. With the grant money, Bria was able to publish a coloring storybook with pictures she drew and written by her mother. “I am very thankful to be a part of the Roots & Shoots program,” she expressed. Recently, in celebration of Earth Day, Bria started a campaign called Chalk the Walk Earth Day. She took to social media, asking people to make sidewalk art representing love for Earth. She then asked that people take pictures of their sidewalk art and post the pictures on social media using the hashtags #chalkthewalkearthday and #‎earthday2016. Even the Wolf Conservation Center supported Chalk the Walk Earth Day. Bria will continue this campaign next year during Earth Day. This coming May 18, Bria will be holding an art reception at the Museum of Visual Materials in Sioux Falls, South Dakota. It will be held from 6:30 to 8:30 p.m. and is open to the public. Bria will be answering questions about her artwork and for each painting sold, 75% of the proceeds will be donated to IFAW. There will be a face-painter at the event and Bria’s new coloring storybook with also be exhibited. After the reception, Bria’s artwork will be on display for two months. If you are interested in learning more about Faces of the Endangered or supporting Bria’s mission by buying some of her artwork please visit her website Pigtails Art. Also, stay updated by “liking” the Faces Of The Endangered Facebook Page. Last but not least, please check out Bria’s Roots & Shoots project page. Abby is a member of the Roots & Shoots U.S. National Youth Leadership Council (NYLC). She is passionate about causes such as literacy, fracking, roadside litter, menstrual hygiene, lyme disease awareness, and wildlife conservation. Her biggest achievement yet has been donating over 1,300 books to organizations serving youth in MA & RI. If she isn’t dancing en pointé at the studio, Abby can be seen exploring state/national parks, creating art, or reading a good book.